This article is about the early medieval language of the Anglo-Saxons. For other uses, see Old English (disambiguation). For Elizabethan or Shakespearean English, see Early Modern English. For the Gothic typeface, see Blackletter. England (except the extreme south-west and north-west), southern and eastern Scotland, and the eastern fringes of modern Wales. Runic, later Latin (Old English alphabet). Old English (Ænglisc, Anglisc, Englisc, pronounced [ˈæŋliʃ]), or Anglo-Saxon, is the earliest historical form of the English language, spoken in England and southern and eastern Scotland in the early Middle Ages. It was brought to Great Britain by Anglo-Saxon settlers probably in the mid-5th century, and the first Old English literary works date from the mid-7th century. After the Norman conquest of 1066, English was replaced, for a time, as the language of the upper classes by Anglo-Norman, a relative of French. This is regarded as marking the end of the Old English era, as during this period the English language was heavily influenced by Anglo-Norman, developing into a phase known now as Middle English. Old English developed from a set of Anglo-Frisian or Ingvaeonic dialects originally spoken by Germanic tribes traditionally known as the Angles, Saxons and Jutes. As the Anglo-Saxons became dominant in England, their language replaced the languages of Roman Britain: Common Brittonic, a Celtic language, and Latin, brought to Britain by Roman invasion. Old English had four main dialects, associated with particular Anglo-Saxon kingdoms: Mercian, Northumbrian, Kentish and West Saxon. It was West Saxon that formed the basis for the literary standard of the later Old English period, although the dominant forms of Middle and Modern English would develop mainly from Mercian. The speech of eastern and northern parts of England was subject to strong Old Norse influence due to Scandinavian rule and settlement beginning in the 9th century. Old English is one of the West Germanic languages, and its closest relatives are Old Frisian and Old Saxon. Like other old Germanic languages, it is very different from Modern English and difficult for Modern English speakers to understand without study. Old English grammar is similar to that of modern German: nouns, adjectives, pronouns and verbs have many inflectional endings and forms, and word order is much freer. The oldest Old English inscriptions were written using a runic system, but from about the 9th century this was replaced by a version of the Latin alphabet. Englisc, which the term English is derived from, means 'pertaining to the Angles'. In Old English, this word was derived from Angles (one of the Germanic tribes who conquered parts of Great Britain in the 5th century). During the 9th century, all invading Germanic tribes were referred to as Englisc. It has been hypothesised that the Angles acquired their name because their land on the coast of Jutland (now mainland Denmark) resembled a fishhook. Proto-Germanic *anguz also had the meaning of 'narrow', referring to the shallow waters near the coast. That word ultimately goes back to Proto-Indo-European *h₂enǵʰ-, also meaning 'narrow'. Another theory is that the derivation of 'narrow' is the more likely connection to angling (as in fishing), which itself stems from a Proto-Indo-European (PIE) root meaning bend, angle. The semantic link is the fishing hook, which is curved or bent at an angle. In any case, the Angles may have been called such because they were a fishing people or were originally descended from such, and therefore England would mean 'land of the fishermen', and English would be 'the fishermen's language'. Continental West Germanic languages (Old Frisian, Old Saxon, Old Dutch, Old High German). Old English was not static, and its usage covered a period of 700 years, from the Anglo-Saxon settlement of Britain in the 5th century to the late 11th century, some time after the Norman invasion. 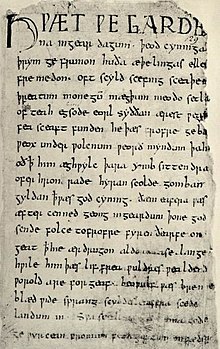 While indicating that the establishment of dates is an arbitrary process, Albert Baugh dates Old English from 450 to 1150, a period of full inflections, a synthetic language. Perhaps around 85 per cent of Old English words are no longer in use, but those that survived are basic elements of Modern English vocabulary. Old English is a West Germanic language, developing out of Ingvaeonic (also known as North Sea Germanic) dialects from the 5th century. It came to be spoken over most of the territory of the Anglo-Saxon kingdoms which became the Kingdom of England. This included most of present-day England, as well as part of what is now southeastern Scotland, which for several centuries belonged to the Anglo-Saxon kingdom of Northumbria. Other parts of the island – Wales and most of Scotland – continued to use Celtic languages, except in the areas of Scandinavian settlements where Old Norse was spoken. Celtic speech also remained established in certain parts of England: Medieval Cornish was spoken all over Cornwall and in adjacent parts of Devon, while Cumbric survived perhaps to the 12th century in parts of Cumbria, and Welsh may have been spoken on the English side of the Anglo-Welsh border. Norse was also widely spoken in the parts of England which fell under Danish law. Anglo-Saxon literacy developed after Christianisation in the late 7th century. The oldest surviving text of Old English literature is Cædmon's Hymn, composed between 658 and 680. There is a limited corpus of runic inscriptions from the 5th to 7th centuries, but the oldest coherent runic texts (notably the Franks Casket) date to the 8th century. The Old English Latin alphabet was introduced around the 9th century. Alfred the Great statue in Winchester, Hampshire. The 9th-century English King proposed that primary education be taught in English, with those wishing to advance to holy orders to continue their studies in Latin. With the unification of the Anglo-Saxon kingdoms (outside the Danelaw) by Alfred the Great in the later 9th century, the language of government and literature became standardised around the West Saxon dialect (Early West Saxon). Alfred advocated education in English alongside Latin, and had many works translated into the English language; some of them, such as Pope Gregory I's treatise Pastoral Care, appear to have been translated by Alfred himself. 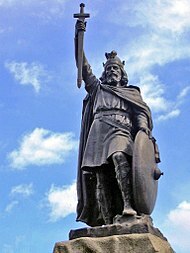 In Old English, typical of the development of literature, poetry arose before prose, but King Alfred the Great (871 to 901) chiefly inspired the growth of prose. A later literary standard, dating from the later 10th century, arose under the influence of Bishop Æthelwold of Winchester, and was followed by such writers as the prolific Ælfric of Eynsham ("the Grammarian"). This form of the language is known as the "Winchester standard", or more commonly as Late West Saxon. It is considered to represent the "classical" form of Old English. It retained its position of prestige until the time of the Norman Conquest, after which English ceased for a time to be of importance as a literary language. Prehistoric Old English (c. 450 to 650); for this period, Old English is mostly a reconstructed language as no literary witnesses survive (with the exception of limited epigraphic evidence). This language, or bloc of languages, spoken by the Angles, Saxons, and Jutes, and pre-dating documented Old English or Anglo-Saxon, has also been called Primitive Old English. Early Old English (c. 650 to 900), the period of the oldest manuscript traditions, with authors such as Cædmon, Bede, Cynewulf and Aldhelm. Late Old English (c. 900 to 1066), the final stage of the language leading up to the Norman conquest of England and the subsequent transition to Early Middle English. The Old English period is followed by Middle English (12th to 15th century), Early Modern English (c. 1480 to 1650) and finally Modern English (after 1650). Old English should not be regarded as a single monolithic entity, just as Modern English is also not monolithic. It emerged over time out of the many dialects and languages of the colonising tribes, and it is only towards the later Anglo-Saxon period that these can be considered to have constituted a single national language. Even then, Old English continued to exhibit much local and regional variation, remnants of which remain in Modern English dialects. The four main dialectal forms of Old English were Mercian, Northumbrian, Kentish, and West Saxon. Mercian and Northumbrian are together referred to as Anglian. In terms of geography the Northumbrian region lay north of the Humber River; the Mercian lay north of the Thames and South of the Humber River; West Saxon lay south and southwest of the Thames; and the smallest, Kentish region lay southeast of the Thames, a small corner of England. The Kentish region, settled by the Jutes from Jutland, has the scantiest literary remains. Each of these four dialects was associated with an independent kingdom on the island. Of these, Northumbria south of the Tyne, and most of Mercia, were overrun by the Vikings during the 9th century. The portion of Mercia that was successfully defended, and all of Kent, were then integrated into Wessex under Alfred the Great. From that time on, the West Saxon dialect (then in the form now known as Early West Saxon) became standardised as the language of government, and as the basis for the many works of literature and religious materials produced or translated from Latin in that period. The later literary standard known as Late West Saxon (see History, above), although centred in the same region of the country, appears not to have been directly descended from Alfred's Early West Saxon. For example, the former diphthong /iy/ tended to become monophthongised to /i/ in EWS, but to /y/ in LWS. Due to the centralisation of power and the Viking invasions, there is relatively little written record of the non-Wessex dialects after Alfred's unification. Some Mercian texts continued to be written, however, and the influence of Mercian is apparent in some of the translations produced under Alfred's programme, many of which were produced by Mercian scholars. Other dialects certainly continued to be spoken, as is evidenced by the continued variation between their successors in Middle and Modern English. In fact, what would become the standard forms of Middle English and of Modern English are descended from Mercian rather than West Saxon, while Scots developed from the Northumbrian dialect. It was once claimed that, owing to its position at the heart of the Kingdom of Wessex, the relics of Anglo-Saxon accent, idiom and vocabulary were best preserved in the dialect of Somerset. For details of the sound differences between the dialects, see Phonological history of Old English (dialects). The language of the Anglo-Saxon settlers appears not to have been significantly affected by the native British Celtic languages which it largely displaced. The number of Celtic loanwords introduced into the language is very small. However, various suggestions have been made concerning possible influence that Celtic may have had on developments in English syntax in the post-Old English period, such as the regular progressive construction and analytic word order, as well as the eventual development of the periphrastic auxiliary verb "do". Old English contained a certain number of loanwords from Latin, which was the scholarly and diplomatic lingua franca of Western Europe. It is sometimes possible to give approximate dates for the borrowing of individual Latin words based on which patterns of sound change they have undergone. Some Latin words had already been borrowed into the Germanic languages before the ancestral Angles and Saxons left continental Europe for Britain. More entered the language when the Anglo-Saxons were converted to Christianity and Latin-speaking priests became influential. It was also through Irish Christian missionaries that the Latin alphabet was introduced and adapted for the writing of Old English, replacing the earlier runic system. Nonetheless, the largest transfer of Latin-based (mainly Old French) words into English occurred after the Norman Conquest of 1066, and thus in the Middle English rather than the Old English period. Another source of loanwords was Old Norse, which came into contact with Old English via the Scandinavian rulers and settlers in the Danelaw from the late 9th century, and during the rule of Cnut and other Danish kings in the early 11th century. Many place-names in eastern and northern England are of Scandinavian origin. Norse borrowings are relatively rare in Old English literature, being mostly terms relating to government and administration. The literary standard, however, was based on the West Saxon dialect, away from the main area of Scandinavian influence; the impact of Norse may have been greater in the eastern and northern dialects. Certainly in Middle English texts, which are more often based on eastern dialects, a strong Norse influence becomes apparent. Modern English contains a great many, often everyday, words that were borrowed from Old Norse, and the grammatical simplification that occurred after the Old English period is also often attributed to Norse influence. The influence of Old Norse certainly helped move English from a synthetic language along the continuum to a more analytic word order, and Old Norse most likely made a greater impact on the English language than any other language. The eagerness of Vikings in the Danelaw to communicate with their southern Anglo-Saxon neighbours produced a friction that led to the erosion of the complicated inflectional word-endings. Simeon Potter notes: "No less far-reaching was the influence of Scandinavian upon the inflexional endings of English in hastening that wearing away and leveling of grammatical forms which gradually spread from north to south. It was, after all, a salutary influence. The gain was greater than the loss. There was a gain in directness, in clarity, and in strength." The strength of the Viking influence on Old English appears from the fact that the indispensable elements of the language – pronouns, modals, comparatives, pronominal adverbs (like "hence" and "together"), conjunctions and prepositions – show the most marked Danish influence; the best evidence of Scandinavian influence appears in the extensive word borrowings for, as Jespersen indicates, no texts exist in either Scandinavia or in Northern England from this time to give certain evidence of an influence on syntax. The change to Old English from Old Norse was substantive, pervasive, and of a democratic character. Old Norse and Old English resembled each other closely like cousins and with some words in common, they roughly understood each other; in time the inflections melted away and the analytic pattern emerged. It is most "important to recognize that in many words the English and Scandinavian language differed chiefly in their inflectional elements. The body of the word was so nearly the same in the two languages that only the endings would put obstacles in the way of mutual understanding. In the mixed population which existed in the Danelaw these endings must have led to much confusion, tending gradually to become obscured and finally lost." This blending of peoples and languages resulted in "simplifying English grammar". The inventory of classical Old English (Late West Saxon) surface phones, as usually reconstructed, is as follows. [dʒ] is an allophone of /j/ occurring after /n/ and when geminated (doubled). [ŋ] is an allophone of /n/ occurring before /k/ and /ɡ/. [v, ð, z] are voiced allophones of /f, θ, s/ respectively, occurring between vowels or voiced consonants. [ç, x] are allophones of /h/ occurring in coda position after front and back vowels respectively. [ɣ] is an allophone of /ɡ/ occurring after a vowel, and, at an earlier stage of the language, in the syllable onset. the voiceless sonorants [ʍ, l̥, n̥, r̥] are analysed as realizing the sequences /hw, hl, hn, hr/. The above system is largely similar to that of Modern English, except that [ç, x, ɣ, l̥, n̥, r̥] (and [ʍ] for most speakers) have generally been lost, while the voiced affricate and fricatives (now also including /ʒ/) have become independent phonemes, as has /ŋ/. The mid front rounded vowels /ø(ː)/ had merged into unrounded /e(ː)/ before the Late West Saxon period. During the 11th century such vowels arose again, as monophthongisations of the diphthongs /e(ː)o/, but quickly merged again with /e(ː)/ in most dialects. The exact pronunciation of the West Saxon close diphthongs, spelt ⟨ie⟩, is disputed; it may have been /i(ː)y/ or /i(ː)e/. Other dialects may have had different systems of diphthongs; for example, Anglian dialects retained /i(ː)u/, which had merged with /e(ː)o/ in West Saxon. For more on dialectal differences, see Phonological history of Old English (dialects). Fronting of [ɑ(ː)] to [æ(ː)] except when nasalised or followed by a nasal consonant ("Anglo-Frisian brightening"), partly reversed in certain positions by later "a-restoration" or retraction. Monophthongisation of the diphthong [ai], and modification of remaining diphthongs to the height-harmonic type. Diphthongisation of long and short front vowels in certain positions ("breaking"). Palatalisation of velars [k], [ɡ], [ɣ], [sk] to [tʃ], [dʒ], [j], [ʃ] in certain front-vowel environments. The process known as i-mutation (which for example led to modern mice as the plural of mouse). Loss of certain weak vowels in word-final and medial positions, and of medial [(i)j]; reduction of remaining unstressed vowels. Diphthongisation of certain vowels before certain consonants when preceding a back vowel ("back mutation"). Loss of /h/ between vowels or between a voiced consonant and a vowel, with lengthening of the preceding vowel. Collapse of two consecutive vowels into a single vowel. "Palatal umlaut", which has given forms such as six (compare German sechs). Nouns decline for five cases: nominative, accusative, genitive, dative, instrumental; three genders: masculine, feminine, neuter; and two numbers: singular, and plural; and are strong or weak. The instrumental is vestigial and only used with the masculine and neuter singular and often replaced by the dative. Only pronouns and strong adjectives retain separate instrumental forms. There is also sparse early Northumbrian evidence of a sixth case: the locative. Adjectives agree with nouns in case, gender, number, and strong, or weak forms. Pronouns and sometimes participles agree in case, gender, and number. First-person and second-person personal pronouns occasionally distinguish dual-number forms. The definite article sē and its inflections serve as a definite article ("the"), a demonstrative adjective ("that"), and demonstrative pronoun. Other demonstratives are þes ("this"), and ġeon ("yon"). These words inflect for case, gender, number. Adjectives have both strong and weak sets of endings, weak ones being used when a definite or possessive determiner is also present. Verbs conjugate for three persons: first, second, and third; two numbers: singular, plural; two tenses: present, and past; three moods: indicative, subjunctive, and imperative; and are strong (exhibiting ablaut) or weak (exhibiting a dental suffix). Verbs have two infinitive forms: bare, and bound; and two participles: present, and past. The subjunctive has past and present forms. Finite verbs agree with subjects in person, and number. The future tense, passive voice, and other aspects are formed with compounds. Adpositions are mostly before but often after their object. If the object of an adposition is marked in the dative case, an adposition may conceivably be located anywhere in the sentence. Remnants of the Old English case system in Modern English are in the forms of a few pronouns (such as I/me/mine, she/her, who/whom/whose) and in the possessive ending -'s, which derives from the masculine and neuter genitive ending -es. The modern English plural ending -(e)s derives from the Old English -as, but the latter applied only to "strong" masculine nouns in the nominative and accusative cases; different plural endings were used in other instances. Old English nouns had grammatical gender, while modern English has only natural gender. Pronoun usage could reflect either natural or grammatical gender when those conflicted, as in the case of ƿīf, a neuter noun referring to a female person. In Old English's verbal compound constructions are the beginnings of the compound tenses of Modern English. Old English verbs include strong verbs, which form the past tense by altering the root vowel, and weak verbs, which use a suffix such as -de. As in Modern English, and peculiar to the Germanic languages, the verbs formed two great classes: weak (regular), and strong (irregular). Like today, Old English had fewer strong verbs, and many of these have over time decayed into weak forms. Then, as now, dental suffixes indicated the past tense of the weak verbs, as in work and worked. Old English syntax is similar to that of modern English. Some differences are consequences of the greater level of nominal and verbal inflection, allowing freer word order. Default word order is verb-second in main clauses, and verb-final in subordinate clauses, being more like modern German than modern English. No do-support in questions and negatives. Questions were usually formed by inverting subject and finite verb, and negatives by placing ne before the finite verb, regardless what verb. Multiple negatives can stack up in a sentence intensifying each other (negative concord). Sentences with subordinate clauses of the type "when X, Y" (e.g. "When I got home, I ate dinner") don't use a wh-type conjunction, but rather a th-type correlative conjunction such as þā, otherwise meaning "then" (e.g. þā X, þā Y in place of "when X, Y"). The wh-words are used only as interrogatives and as indefinite pronouns. Similarly, wh- forms were not used as relative pronouns. Instead, the indeclinable word þe is used, often preceded by (or replaced by) the appropriate form of the article/demonstrative se. Old English was first written in runes, using the futhorc – a rune set derived from the Germanic 24-character elder futhark, extended by five more runes used to represent Anglo-Saxon vowel sounds, and sometimes by several more additional characters. From around the 9th century, the runic system came to be supplanted by a (minuscule) half-uncial script of the Latin alphabet introduced by Irish Christian missionaries. This was replaced by insular script, a cursive and pointed version of the half-uncial script. This was used until the end of the 12th century when continental Carolingian minuscule (also known as Caroline) replaced the insular. The Latin alphabet of the time still lacked the letters ⟨j⟩ and ⟨w⟩, and there was no ⟨v⟩ as distinct from ⟨u⟩; moreover native Old English spellings did not use ⟨k⟩, ⟨q⟩ or ⟨z⟩. The remaining 20 Latin letters were supplemented by four more: ⟨æ⟩ (æsc, modern ash) and ⟨ð⟩ (ðæt, now called eth or edh), which were modified Latin letters, and thorn ⟨þ⟩ and wynn ⟨ƿ⟩, which are borrowings from the futhorc. A few letter pairs were used as digraphs, representing a single sound. Also used was the Tironian note ⟨⁊⟩ (a character similar to the digit 7) for the conjunction and. A common scribal abbreviation was a thorn with a stroke ⟨ꝥ⟩, which was used for the pronoun þæt. Macrons over vowels were originally used not to mark long vowels (as in modern editions), but to indicate stress, or as abbreviations for a following m or n.
Modern editions of Old English manuscripts generally introduce some additional conventions. The modern forms of Latin letters are used, including ⟨g��� in place of the insular G, ⟨s⟩ for long S, and others which may differ considerably from the insular script, notably ⟨e⟩, ⟨f⟩ and ⟨r⟩. Macrons are used to indicate long vowels, where usually no distinction was made between long and short vowels in the originals. (In some older editions an acute accent mark was used for consistency with Old Norse conventions.) Additionally, modern editions often distinguish between velar and palatal ⟨c⟩ and ⟨g⟩ by placing dots above the palatals: ⟨ċ⟩, ⟨ġ⟩. The letter wynn ⟨ƿ⟩ is usually replaced with ⟨w⟩, but æsc, eth and thorn are normally retained (except when eth is replaced by thorn). In contrast with Modern English orthography, that of Old English was reasonably regular, with a mostly predictable correspondence between letters and phonemes. There were not usually any silent letters—in the word cniht, for example, both the ⟨c⟩ and ⟨h⟩ were pronounced, unlike the ���k⟩ and ⟨gh⟩ in the modern knight. 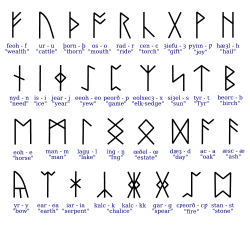 The following table lists the Old English letters and digraphs together with the phonemes they represent, using the same notation as in the Phonology section above. /ɑ/, /ɑː/ Spelling variations like ⟨land⟩ ~ ⟨lond⟩ ("land") suggest the short vowel may have had a rounded allophone [ɒ] before [n] in some cases. /ɑː/ Used in modern editions to distinguish from short /ɑ/. /æ/, /æː/ Formerly the digraph ⟨ae⟩ was used; ⟨æ⟩ became more common during the 8th century, and was standard after 800. In 9th-century Kentish manuscripts, a form of ⟨æ��� that was missing the upper hook of the ⟨a⟩ part was used; it is not clear whether this represented /æ/ or /e/. See also ę. /æː/ Used in modern editions to distinguish from short /æ/. [v] (an allophone of /f/) Used in this way in early texts (before 800). For example, the word "sheaves" is spelled scēabas in an early text, but later (and more commonly) as scēafas. /tʃ/ The /tʃ/ pronunciation is sometimes written with a diacritic by modern editors: most commonly ⟨ċ⟩, sometimes ⟨č⟩ or ⟨ç⟩. Before a consonant letter the pronunciation is always /k/; word-finally after ⟨i⟩ it is always /tʃ/. Otherwise, a knowledge of the history of the word is needed to predict the pronunciation with certainty, although it is most commonly /tʃ/ before front vowels (other than [y]) and /k/ elsewhere. (For details, see Phonological history of Old English § Palatalization.) See also the digraphs cg, sc. /d/ In the earliest texts it also represented /θ/ (see þ). /θ/, including its allophone [ð] Called ðæt in Old English; now called eth or edh. Derived from the insular form of ⟨d⟩ with the addition of a cross-bar. See also þ. A modern editorial substitution for the modified Kentish form of ⟨æ⟩ (see æ). Compare e caudata, ę. /eː/ Used in modern editions to distinguish from short /e/. /æɑ/, /æːɑ/ Sometimes stands for /æ/, /æː/ or /ɑ/ after ⟨ċ⟩, ⟨ġ⟩ (see palatal diphthongization). /æːɑ/ Used in modern editions to distinguish from short /æɑ/. Sometimes stands for /æː/ after ⟨ċ⟩, ⟨ġ⟩. /eo/, /eːo/ Sometimes stands for /o/ after ⟨ċ⟩, ⟨ġ⟩ (see palatal diphthongization). /eːo/ Used in modern editions, to distinguish from short /eo/. /f/, including its allophone [v] (but see b). /h/, including its allophones [ç, x] In the combinations ⟨hl⟩, ⟨hr⟩, ⟨hn⟩, ⟨hw⟩, the realization may have been a devoiced version of the second consonant. /iː/ Used in modern editions to distinguish from short /i/. /e/, /eː/ Only occurs sometimes in this sense and appears after ⟨ċ⟩, ⟨ġ⟩ (see palatal diphthongization). /iːy/ Used in modern editions, to distinguish from short /iy/. Sometimes stands for /eː/ after ⟨ċ⟩, ⟨ġ⟩ . /iu/, /iːu/ Occurs in dialects that had such diphthongs. Not present in Late West Saxon. The long variant may be shown in modern editions as īo. /k/ Rarely used; this sound is normally represented by ⟨c⟩. /l/ Probably velarised [ɫ] (as in Modern English) when in coda position. /n/, including its allophone [ŋ] (before /k/, /g/). /o/, /oː/ See also a. /oː/ Used in modern editions, to distinguish from short /o/. /ø/, /øː/ (in dialects having that sound). /øː/ Used in modern editions, to distinguish from short /ø/. /kw/ A rare spelling of /kw/, which was usually written as ⟨cƿ⟩ (⟨cw⟩ in modern editions). /r/ The exact nature of Old English /r/ is not known; it may have been an alveolar approximant [ɹ] as in most modern English, an alveolar flap [ɾ], or an alveolar trill [r]. /s/, including its allophone [z]. Represented /θ/ in the earliest texts (see þ). /θ/, including its allophone [ð] Called thorn and derived from the rune of the same name. In the earliest texts ⟨d⟩ or ⟨th⟩ was used for this phoneme, but these were later replaced in this function by eth ⟨ð⟩ and thorn ⟨þ⟩. Eth was first attested (in definitely dated materials) in the 7th century, and thorn in the 8th. Eth was more common than thorn before Alfred's time. From then onward, thorn was used increasingly often at the start of words, while eth was normal in the middle and at the end of words, although usage varied in both cases. Some modern editions use only thorn. See also Pronunciation of English ⟨th⟩. /u/, /uː/. Also sometimes /w/ (see ƿ, below). Sometimes used for /w/ (see ƿ, below). Used for /uː/ in modern editions, to distinguish from short /u/. /w/ A modern substitution for ⟨ƿ⟩. /w/ Called wynn and derived from the rune of the same name. In earlier texts by continental scribes, and also later in the north, /w/ was represented by ⟨u⟩ or ⟨uu⟩. In modern editions, wynn is replaced by ⟨w⟩, to prevent confusion with ⟨p⟩. /ks/ ([xs ~ çs] according to some authors[which?]). /yː/ Used in modern editions to distinguish from short /y/. /ts/ A rare spelling for /ts/; e.g. betst ("best") is occasionally spelt bezt. Doubled consonants are geminated; the geminate fricatives ⟨ðð⟩/⟨þþ⟩, ⟨ff⟩ and ⟨ss⟩ cannot be voiced. In such historical conditions, an incalculable amount of the writings of the Anglo-Saxon period perished. What they contained, how important they were for an understanding of literature before the Conquest, we have no means of knowing: the scant catalogues of monastic libraries do not help us, and there are no references in extant works to other compositions....How incomplete our materials are can be illustrated by the well-known fact that, with few and relatively unimportant exceptions, all extant Anglo-Saxon poetry is preserved in four manuscripts. Some of the most important surviving works of Old English literature are Beowulf, an epic poem; the Anglo-Saxon Chronicle, a record of early English history; the Franks Casket, an inscribed early whalebone artefact; and Cædmon's Hymn, a Christian religious poem. There are also a number of extant prose works, such as sermons and saints' lives, biblical translations, and translated Latin works of the early Church Fathers, legal documents, such as laws and wills, and practical works on grammar, medicine, and geography. Still, poetry is considered the heart of Old English literature. Nearly all Anglo-Saxon authors are anonymous, with a few exceptions, such as Bede and Cædmon. Cædmon, the earliest English poet we know by name, served as a lay brother in the monastery at Whitby. The first example is taken from the opening lines of the folk-epic Beowulf, a poem of some 3,000 lines and the single greatest work of Old English. This passage describes how Hrothgar's legendary ancestor Scyld was found as a baby, washed ashore, and adopted by a noble family. The translation is literal and represents the original poetic word order. As such, it is not typical of Old English prose. The modern cognates of original words have been used whenever practical to give a close approximation of the feel of the original poem. The words in brackets are implied in the Old English by noun case and the bold words in brackets are explanations of words that have slightly different meanings in a modern context. Notice how what is used by the poet where a word like lo or behold would be expected. This usage is similar to what-ho!, both an expression of surprise and a call to attention. English poetry is based on stress and alliteration. In alliteration, the first consonant in a word alliterates with the same consonant at the beginning of another word, as with Gār-Dena and ġeār-dagum. Vowels alliterate with any other vowel, as with æþelingas and ellen. In the text below, the letters that alliterate are bolded. hū ðā æþelingas ellen fremedon. how those athelings (noblemen) did ellen (fortitude/courage/zeal) freme (promote). gomban gyldan. ��æt ƿæs gōd cyning! [and] yeme (heed/obedience; related to "gormless") yield. That was [a] good king! Lo! We have heard of majesty of the Spear-Danes, of those nation-kings in the days of yore, and how those noblemen promoted zeal. Scyld Scefing took away mead-benches from bands of enemies, from many tribes; he terrified earls. Since he was first found destitute (he gained consolation for that) he grew under the heavens, prospered in honours, until each of those who lived around him over the sea had to obey him, give him tribute. That was a good king! This text of the Lord's Prayer is presented in the standardised West Saxon literary dialect, with added macrons for vowel length, markings for probable palatalised consonants, modern punctuation, and the replacement of the letter ƿynn with w.
 Sī þīn nama ġehālgod. /siː θiːn ˈnɑ.mɑ je.ˈhɑɫ.ɡod/ Be thy name hallowed. ġewurþe þīn willa, on eorðan swā swā on heofonum. /je.ˈwur.ðe θiːn ˈwi.lːɑ on ˈeor.ðan swɑː swɑː on ˈheo.vo.num/ Worth (manifest) thy will, on earth as also in heaven. And ne ġelǣd þū ūs on costnunge, ac ālȳs ūs of yfele. /ɑnd ne je.læːd θuː uːs on kost.ˈnuŋ.ɡe ɑk ɑː.ˈlyːs uːs of y.ˈve.le/ And do not lead thou us into temptation, but alese (release/deliver) us of (from) evil. This is a proclamation from King Cnut the Great to his earl Thorkell the Tall and the English people written in AD 1020. Unlike the previous two examples, this text is prose rather than poetry. For ease of reading, the passage has been divided into sentences while the pilcrows represent the original division. ¶ Cnut cyning gret his arcebiscopas and his leod-biscopas and Þurcyl eorl and ealle his eorlas and ealne his þeodscype, tƿelfhynde and tƿyhynde, gehadode and læƿede, on Englalande freondlice. ¶ Cnut, king, greets his archbishops and his lede'(people's)'-bishops and Thorkell, earl, and all his earls and all his peopleship, greater (having a 1200 shilling weregild) and lesser (200 shilling weregild), hooded(ordained to priesthood) and lewd(lay), in England friendly. And ic cyðe eoƿ, þæt ic ƿylle beon hold hlaford and unsƿicende to godes gerihtum and to rihtre ƿoroldlage. And I kithe(make known/couth to) you, that I will be [a] hold(civilised) lord and unswiking(uncheating) to God's rights(laws) and to [the] rights(laws) worldly. ¶ Ic nam me to gemynde þa geƿritu and þa ƿord, þe se arcebiscop Lyfing me fram þam papan brohte of Rome, þæt ic scolde æghƿær godes lof upp aræran and unriht alecgan and full frið ƿyrcean be ðære mihte, þe me god syllan ƿolde. ¶ I nam(took) me to mind the writs and the word that the Archbishop Lyfing me from the Pope brought of Rome, that I should ayewhere(everywhere) God's love(praise) uprear(promote), and unright(outlaw) lies, and full frith(peace) work(bring about) by the might that me God would(wished) [to] sell'(give). ¶ Nu ne ƿandode ic na minum sceattum, þa hƿile þe eoƿ unfrið on handa stod: nu ic mid godes fultume þæt totƿæmde mid minum scattum. ¶ Now, ne went(withdrew/changed) I not my shot(financial contribution, cf. Norse cognate in scot-free) the while that you stood(endured) unfrith(turmoil) on-hand: now I, mid(with) God's support, that [unfrith] totwemed(separated/dispelled) mid(with) my shot(financial contribution). Þa cydde man me, þæt us mara hearm to fundode, þonne us ƿel licode: and þa for ic me sylf mid þam mannum þe me mid foron into Denmearcon, þe eoƿ mæst hearm of com: and þæt hæbbe mid godes fultume forene forfangen, þæt eoƿ næfre heonon forð þanon nan unfrið to ne cymð, þa hƿile þe ge me rihtlice healdað and min lif byð. Tho(then) [a] man kithed(made known/couth to) me that us more harm had found(come upon) than us well liked(equalled): and tho(then) fore(travelled) I, meself, mid(with) those men that mid(with) me fore(travelled), into Denmark that [to] you most harm came of(from): and that[harm] have [I], mid(with) God's support, afore(previously) forefangen(forestalled) that to you never henceforth thence none unfrith(breach of peace) ne come the while that ye me rightly hold(behold as king) and my life beeth. The earliest history of Old English lexicography lies in the Anglo-Saxon period itself, when English-speaking scholars created English glosses on Latin texts. At first these were often marginal or interlinear glosses, but soon came to be gathered into word-lists such as the Épinal-Erfurt, Leiden and Corpus Glossaries. Over time, these word-lists were consolidated and alphabeticised to create extensive Latin-Old English glossaries with some of the character of dictionaries, such as the Cleopatra Glossaries, the Harley Glossary and the Brussels Glossary. In some cases, the material in these glossaries continued to be circulated and updated in Middle English glossaries, such as the Durham Plant-Name Glossary and the Laud Herbal Glossary. Old English lexicography was revived in the early modern period, drawing heavily on Anglo-Saxons' own glossaries. The major publication at this time was William Somner's Dictionarium Saxonico-Latino-Anglicum. The next substantial Old English dictionary was Joseph Bosworth's Anglo-Saxon Dictionary of 1838. Cameron, Angus, et al. (ed.) (1983-). Dictionary of Old English. Toronto: Published for the Dictionary of Old English Project, Centre for Medieval Studies, University of Toronto by the Pontifical Institute of Medieval Studies. Initially issued on microfiche and subsequently as a CD-ROM, the dictionary is now primarily published online at https://www.doe.utoronto.ca. This generally supersedes previous dictionaries where available. As of September 2018, the dictionary covered A-I. T. Northcote Toller. (1921). An Anglo-Saxon Dictionary: Supplement. Oxford: Clarendon Press. Alistair Campbell (1972). An Anglo-Saxon Dictionary: Enlarged addenda and corrigenda. Oxford: Clarendon Press. Clark Hall, J. R.. (1969). A Concise Anglo-Saxon Dictionary. 4th rev. edn by Herbet D. Meritt. Cambridge: Cambridge University Press. Occasionally more accurate than Bosworth-Toller, and widely used as a reading dictionary. Various digitisations are available, including here. Roberts, Jane and Christian Kay, with Lynne Grundy, A Thesaurus of Old English in Two Volumes, Costerus New Series, 131–32, 2nd rev. impression, 2 vols (Amsterdam: Rodopi, 2000), also available online. A thesaurus based on the definitions in Bosworth-Toller and the structure of Roget's Thesaurus. Though focused on later periods, the Oxford English Dictionary, Middle English Dictionary, Dictionary of the Older Scottish Tongue, and Historical Thesaurus of English all also include material relevant to Old English. Like other historical languages, Old English has been used by scholars and enthusiasts of later periods to create texts either imitating Anglo-Saxon literature or deliberately transferring it to a different cultural context. Examples include Alistair Campbell and J. R. R. Tolkien. Ransom Riggs uses several Old English words, such as syndrigast(singular, peculia), ymbryne(period, cycle), etc., dubbed as "Old Peculiar" ones. A number of websites devoted to Modern Paganism and historical reenactment offer reference material and forums promoting the active use of Old English. There is also an Old English version of Wikipedia. However, one investigation found that many Neo-Old English texts published online bear little resemblance to the historical language and have many basic grammatical mistakes. ^ Hammarström, Harald; Forkel, Robert; Haspelmath, Martin, eds. (2017). "Old English (ca. 450-1100)". Glottolog 3.0. Jena, Germany: Max Planck Institute for the Science of Human History. ^ By the 16th century the term Anglo-Saxon came to refer to all things of the early English period, including language, culture, and people. While it remains the normal term for the latter two aspects, the language began to be called Old English towards the end of the 19th century, as a result of the increasingly strong anti-Germanic nationalism in English society of the 1890s and early 1900s. However many authors still also use the term Anglo-Saxon to refer to the language. Crystal, David (2003). The Cambridge Encyclopedia of the English Language. Cambridge University Press. ISBN 0-521-53033-4. ^ a b c d e f g h i j k l m n o Baugh, Albert (1951). A History of the English Language. London: Routledge & Kegan Paul. pp. 60–83, 110–130 (Scandinavian influence). ^ Fennell, Barbara 1998. A history of English. A sociolinguistic approach. Oxford: Blackwell. ^ Pyles, Thomas and John Algeo 1993. Origins and development of the English language. 4th edition. (New York: Harcourt, Brace, Jovanovich). ^ Barber, Charles, Joan C. Beal and Philip A. Shaw 2009. The English language. A historical introduction. Second edition of Barber (1993). Cambridge: University Press. ^ Mugglestone, Lynda (ed.) 2006. The Oxford History of English. Oxford: University Press. ^ Hogg, Richard M. and David Denison (ed.) 2006. A history of the English language. Cambridge: University Press. ^ Baugh, Albert C. and Thomas Cable 1993 A history of the English language. 4th edition. (Englewood Cliffs: Prentice Hall). ^ Hogg (1992), p. 83. ^ Stumpf, John (1970). An Outline of English Literature; Anglo-Saxon and Middle English Literature. London: Forum House Publishing Company. p. 7. We do not know what languages the Jutes, Angles, and Saxons spoke, nor even whether they were sufficiently similar to make them mutually intelligible, but it is reasonable to assume that by the end of the sixth century there must have been a language that could be understood by all and this we call Primitive Old English. ^ Campbell, Alistair (1959). Old English Grammar. Oxford: Oxford University Press. p. 4. ISBN 0-19-811943-7. ^ Hogg (1992), p. 117; but for a different interpretation of this, see Old English diphthongs. ^ Magennis (2011), pp. 56–60. ^ "Rotary-munich.de" (PDF). Archived from the original (PDF) on 27 March 2009. Retrieved 20 June 2011. ^ Scott, Shay (30 January 2008). The history of English: a linguistic introduction. Wardja Press. p. 86. ISBN 978-0-615-16817-3. Retrieved 29 January 2012. ^ a b c d Jespersen, Otto (1919). Growth and Structure of the English Language. Leipzig, Germany: B. G. Teubner. pp. 58–82. ^ BBC World News (27 December 2014). "[BBC World News] BBC Documentary English Birth of a Language - 35:00 to 37:20". BBC. Retrieved 4 January 2016. ^ Crystal, David (1995). The Cambridge Encyclopedia of the English Language. Cambridge, UK: Cambridge University Press. p. 32. ^ a b McCrum, Robert (1987). The Story of English. London: Faber and Faber. pp. 70–71. ^ Potter, Simeon (1950). Our Language. Harmondsworth, Middlesex, England: Penguin Books Ltd. p. 33. ^ Lohmeier, Charlene (28 October 2012). "121028 Charlene Lohmeier "Evolution of the English Language" - 23:40 - 25:00; 30:20 - 30:45; 45:00 - 46:00". 121028 Charlene Lohmeier "Evolution of the English Language". Dutch Lichliter. ^ Blake (1992), pp. 42–43. ^ a b "Continuum Encyclopedia of British Literature". Continuum. ^ Mitchell, Bruce; Robinson, Fred C (2002). A Guide to Old English. Oxford: Blackwell Publishing. pp. 109–112. ^ Crystal, David (1987). The Cambridge Encyclopedia of Language. Cambridge University Press. p. 203. ISBN 0-521-26438-3. ^ C.M. Millward, Mary Hayes, A Biography of the English Language, Cengage Learning 2011, p. 96. ^ Stephen Pollington, First Steps in Old English, Anglo-Saxon Books 1997, p. 138. ^ Lit. a participle: "guilting" or "[a person who is] sinning"; cf. Latin cognate -ant/-ent. ^ Patrizia Lendinara, ‘Anglo-Saxon Glosses and Glossaries: An Introduction’, in Anglo-Saxon Glosses and Glossaries (Aldershot: Variorum, 1999), pp. 1–26. ^ Das Durhamer Pflanzenglossar: lateinisch und altenglish, ed. by Bogislav von Lindheim, Beiträge zur englischen Philologie, 35 (Bochum-Langendreer: Poppinghaus, 1941). ^ William Somner, Dictionarium Saxonico-Latino-Anglicum, English Linguistics 1500–1800 (A Collection of Facsimile Reprints), 247 (Menston: The Scholar Press, 1970). ^ Robinson, Fred C. ‘The Afterlife of Old English’. The Tomb of Beowulf and Other Essays on Old English. Oxford: Blackwell, 1993. 275-303. ^ Christina Neuland and Florian Schleburg. (2014). "A New Old English? The Chances of an Anglo-Saxon Revival on the Internet". In: S. Buschfeld et al. (Eds. ), The Evolution of Englishes. The Dynamic Model and Beyond (pp. 486–504). Amsterdam: John Benjamins. Whitelock, Dorothy, ed. (1955). English Historical Documents. I: c. 500–1042. London: Eyre & Spottiswoode. Baker, Peter S (2003). Introduction to Old English. Blackwell Publishing. ISBN 0-631-23454-3. Baugh, Albert C; & Cable, Thomas. (1993). A History of the English Language (4th ed.). London: Routledge. Blake, Norman (1992). The Cambridge History of the English Language: Vol. 2. Cambridge: Cambridge University Press. Campbell, A. (1959). Old English Grammar. Oxford: Clarendon Press. Euler, Wolfram (2013). Das Westgermanische [rest of title missing] (West Germanic: from its Emergence in the 3rd up until its Dissolution in the 7th Century CE: Analyses and Reconstruction). 244 p., in German with English summary, London/Berlin 2013, ISBN 978-3-9812110-7-8. Hogg, Richard M. (ed.). (1992). The Cambridge History of the English Language: (Vol 1): the Beginnings to 1066. Cambridge: Cambridge University Press. Hogg, Richard; & Denison, David (eds.) (2006) A History of the English Language. Cambridge: Cambridge University Press. Lass, Roger (1994). Old English: A historical linguistic companion. Cambridge: Cambridge University Press. ISBN 0-521-43087-9. Magennis, Hugh (2011). The Cambridge Introduction to Anglo-Saxon Literature. Cambridge University Press. Millward, Celia (1996). A Biography of the English Language. Harcourt Brace. ISBN 0-15-501645-8. Mitchell, Bruce; Robinson, Fred C (2001). A Guide to Old English (6th ed.). Oxford: Blackwell. ISBN 0-631-22636-2. Quirk, Randolph; & Wrenn, CL (1957). An Old English Grammar (2nd ed.) London: Methuen. Ringe, Donald R and Taylor, Ann (2014). The Development of Old English - A Linguistic History of English, vol. II, 632p. ISBN 978-0199207848. Oxford. Strang, Barbara M. H. (1970) A History of English. London: Methuen. Robinson, Orrin W. (1992). Old English and Its Closest Relatives. Stanford University Press. ISBN 0-8047-2221-8. Bremmer Jr, Rolf H. (2009). An Introduction to Old Frisian. History, Grammar, Reader, Glossary. Amsterdam and Philadelphia: John Benjamins. Stenton, FM (1971). Anglo-Saxon England (3rd ed.). Oxford: Clarendon Press. Bourcier, Georges. (1978). L'orthographie de l'anglais: Histoire et situation actuelle. Paris: Presses Universitaires de France. Elliott, Ralph WV (1959). Runes: An introduction. Manchester: Manchester University Press. Keller, Wolfgang. (1906). Angelsächsische Paleographie, I: Einleitung. Berlin: Mayer & Müller. Ker, NR (1957). A Catalogue of Manuscripts Containing Anglo-Saxon. Oxford: Clarendon Press. Page, RI (1973). An Introduction to English Runes. London: Methuen. Scragg, Donald G (1974). A History of English Spelling. Manchester: Manchester University Press. Anderson, John M; & Jones, Charles. (1977). Phonological structure and the history of English. North-Holland linguistics series (No. 33). Amsterdam: North-Holland. Brunner, Karl. (1965). Altenglische Grammatik (nach der angelsächsischen Grammatik von Eduard Sievers neubearbeitet) (3rd ed.). Tübingen: Max Niemeyer. Cercignani, Fausto (1983). "The Development of */k/ and */sk/ in Old English". Journal of English and Germanic Philology, 82 (3): 313–323. Girvan, Ritchie. (1931). Angelsaksisch Handboek; E. L. Deuschle (transl.). (Oudgermaansche Handboeken; No. 4). Haarlem: Tjeenk Willink. Halle, Morris; & Keyser, Samuel J. (1971). English Stress: its form, its growth, and its role in verse. New York: Harper & Row. Hockett, Charles F (1959). "The stressed syllabics of Old English". Language. 35 (4): 575–597. doi:10.2307/410597. JSTOR 410597. Hogg, Richard M. (1992). A Grammar of Old English, I: Phonology. Oxford: Blackwell. Kuhn, Sherman M (1961). "On the Syllabic Phonemes of Old English". Language. 37 (4): 522–538. doi:10.2307/411354. JSTOR 411354. Kuhn, Sherman M. (1970). "On the consonantal phonemes of Old English". In: J. L. Rosier (ed.) Philological Essays: studies in Old and Middle English language and literature in honour of Herbert Dean Merritt (pp. 16–49). The Hague: Mouton. Lass, Roger; & Anderson, John M. (1975). Old English Phonology. (Cambridge studies in linguistics; No. 14). Cambridge: Cambridge University Press. Luick, Karl. (1914–1940). Historische Grammatik der englischen Sprache. Stuttgart: Bernhard Tauchnitz. Maling, J (1971). "Sentence stress in Old English". Linguistic Inquiry. 2 (3): 379–400. JSTOR 4177642. McCully, CB; Hogg, Richard M (1990). "An account of Old English stress". Journal of Linguistics. 26 (2): 315–339. doi:10.1017/S0022226700014699. Moulton, WG (1972). "The Proto-Germanic non-syllabics (consonants)". In: F van Coetsem & HL Kufner (Eds. ), Toward a Grammar of Proto-Germanic (pp. 141–173). Tübingen: Max Niemeyer. Sievers, Eduard (1893). Altgermanische Metrik. Halle: Max Niemeyer. Wagner, Karl Heinz (1969). Generative Grammatical Studies in the Old English language. Heidelberg: Julius Groos. Wagner, Karl Heinz. (1969). Generative grammatical studies in the Old English language. Heidelberg: Julius Groos. Brunner, Karl. (1962). Die englische Sprache: ihre geschichtliche Entwicklung (Vol. II). Tübingen: Max Niemeyer. Kemenade, Ans van. (1982). Syntactic Case and Morphological Case in the History of English. Dordrecht: Foris. MacLaughlin, John C. (1983). Old English Syntax: a handbook. Tübingen: Max Niemeyer. Timofeeva, Olga. (2010) Non-finite Constructions in Old English, with Special Reference to Syntactic Borrowing from Latin, PhD dissertation, Mémoires de la Société Néophilologique de Helsinki, vol. LXXX, Helsinki: Société Néophilologique. Traugott, Elizabeth Closs. (1972). A History of English Syntax: a transformational approach to the history of English sentence structure. New York: Holt, Rinehart & Winston. Visser, F. Th. (1963–1973). An Historical Syntax of the English Language (Vols. 1–3). Leiden: E. J. Brill. Toller, T. Northcote. (1921). An Anglo-Saxon Dictionary: Supplement. Oxford: Clarendon Press. Campbell, A. (1972). An Anglo-Saxon Dictionary: Enlarged addenda and corrigenda. Oxford: Clarendon Press. Clark Hall, J. R.; & Merritt, H. D. (1969). A Concise Anglo-Saxon Dictionary (4th ed.). Cambridge: Cambridge University Press. For a list of words relating to Old English, see the Old English language category of words in Wiktionary, the free dictionary. 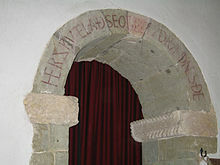 Wikimedia Commons has media related to Old English.